Large seizures of illegal ivory from at least 2,500 elephants hit an all-time high during 2011, according to a top environmental group. At least 13 seizures have been made of more than 800kg of ivory - more than double the previous year, says TRAFFIC, a wildlife trade-monitoring network run by WWF and the International Union for Conservation of Nature. TRAFFIC's Elephant expert, Tom Milliken, says "In 23 years of compiling ivory seizure data for ETIS, this is the worst year ever for large ivory seizures--2011 has truly been a horrible year for elephants." The seizures, which weigh more than 23 tonnes, are evidence of a steep increase in illegal ivory trading over the last four years. Most came from ports in Kenya and Tanzania. The most recent seizure came just before Christmas when 727 pieces of ivory were found hidden in a container at Mombassa, Kenya, bound for Asia. Mr Milliken is in charge of the Elephant Trade Information System (ETIS), which monitors the illegal trade in ivory. ETIS contains records of more than 17,000 reported seizures of ivory and other elephant products since 1989. Once smaller seizures are taken into account, 2011 could be the worst ever for elephants since the records began. 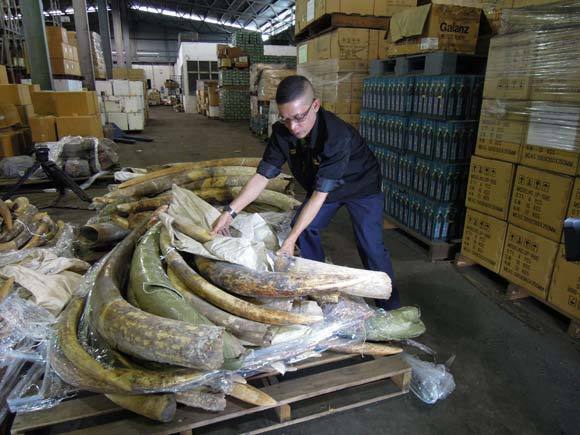 "The escalating large ivory quantities involved in 2011 reflect both a rising demand in Asia and the increasing sophistication of the criminal gangs behind the trafficking. Most illegal shipments of African elephant ivory end up in either China or Thailand," Mr Milliken adds. The smugglers seem to have switched from using air freight to sea ports, but different routes are used. "The only common denominator in the trafficking is that the ivory departs Africa and arrives in Asia, but the routes are constantly changing, presumably reflecting where the smugglers gamble on being their best chance of eluding detection." Malaysia has been used as a transit country in almost half of the large seizures last year, says TRAFFIC, which warned of the possibility two years ago. 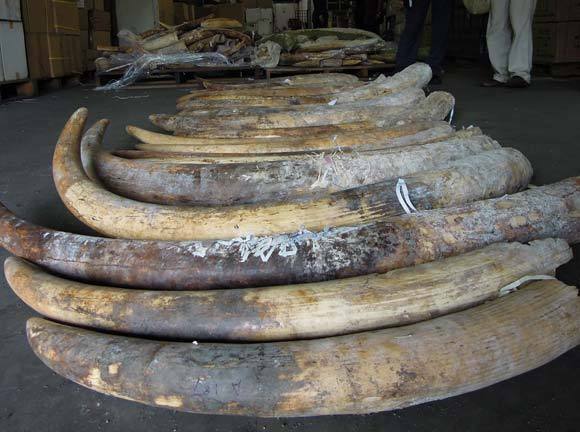 Recently, Malaysia customs officers discovered 1.4 tonnes of ivory (which was widely misreported as being 15 tonnes) hidden in a shipping container being transported from Kenya to Cambodia. When the cargo reaches Asia, the shipping documents are altered to hide the fact that it has come from Africa. "That's an indication of the level of sophistication enforcement officers are up against in trying to outwit the criminal masterminds behind this insidious trade," Mr Milliken adds. "As most large-scale ivory seizures fail to result in any arrests, I fear the criminals are winning." TRAFFIC's work on revealing the illegal ivory trade is partly financed by the WWF, the US Fish and Wildlife Service and the Liz Claiborne Art Ortenberg Foundation. WWF is one of the world's largest independent conservation bodies. It has more than 5 million supporters across more than 100 countries. It aims to help preserve the earth's natural environment and help promote conservation, sustainable practices and a reduction in pollution and wasteful consumption.